A giant magma chamber simmering beneath the Hawaiian Islands is closer to the surface than any other magma chamber yet measured on the planet—as little as 1.9 to 2.5 miles (3 to 4 kilometers) below the surface, according to Julie Ditkof, who presented the findings December 14 at a meeting of the American Geophysical Union in San Francisco. Ditkof, of Ohio State University, determined the chemical composition of crystals in a thousand samples of volcanic rock taken from Hawaii's most volcanically active regions, the Big Island and an adjacent undersea volcano called Loihi. Using a method developed in Iceland by Michael Barton, Ditkof's advisor and research partner at Ohio State, she paid particular attention to olivine, the first mineral in Earth's crust to crystallize as temperatures and pressures drop. The ratios of certain elements in each olivine sample told her how deep the lava had been when it left the magma chamber and began crystallizing—and therefore the depth of the magma itself, said Ditkof. In 2008 workers doing exploratory drilling for a geothermal plant reported that they had accidentally broken through to a shallow magma chamber near the Big Island's Kilauea volcano. 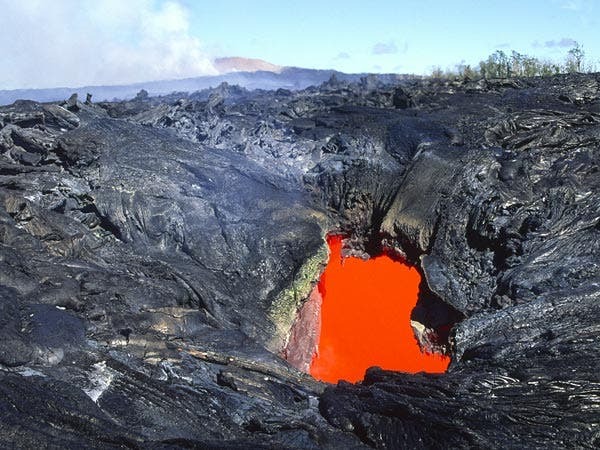 Prior studies of other minerals in Hawaiian volcanic rock, for example, had suggested that the local lava comes from as deep as perhaps 11 to 25 miles (18 to 40 kilometers) down. But seismic studies appeared to show magma chambers at much shallower depths—about 1.2 to 3.7 miles (2 to 6 kilometers). "We wanted to prove one right or one wrong," Ditkof said. The discovery of magma so close to the surface might provide Hawaii with an accessible source of alternative energy. That could be good news for the state, which generates 90 percent of its power from imported oil, "resulting in electricity that costs five times more than the national average," according to Scientific American. Ditkof added: "Very shallow magma chambers mean there is a very shallow geothermal heat source that could be tapped," for example to generate steam to power turbines in electrical plants, she said. "If someone could utilize that, you have amazing geothermal potentials."